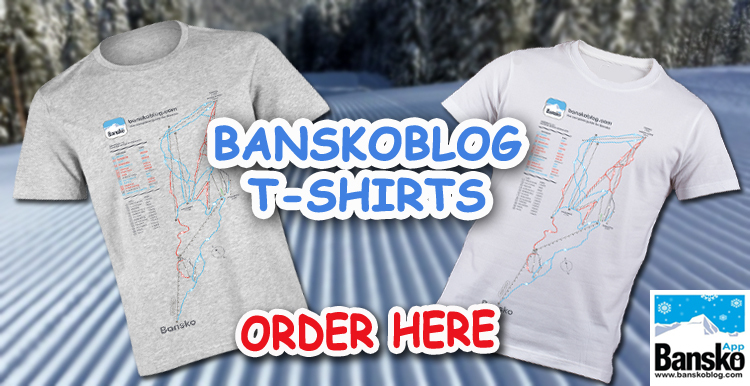 The new Bansko piste map* is ready. Fresh from the artist’s fine hands. 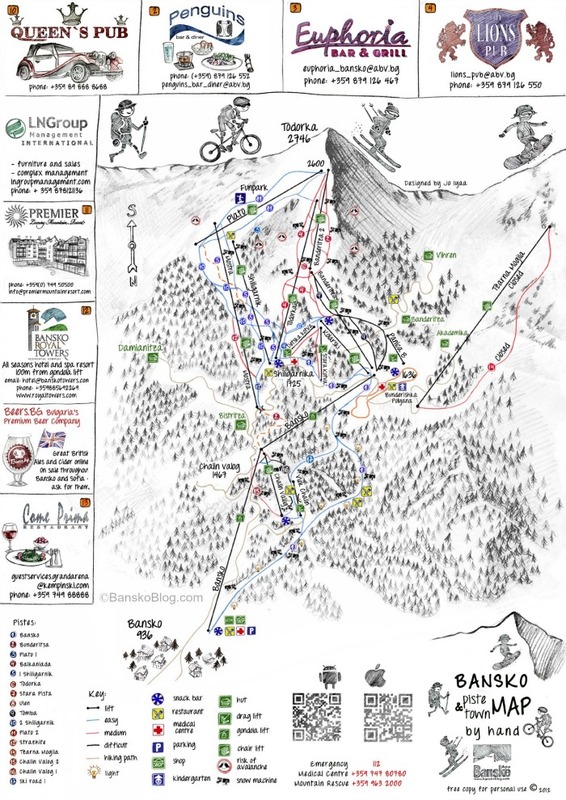 I have not been happy with most of the Bansko piste maps I have seen. Some glaring inaccuracies and omissions have not been fixed over the years. So I commissioned a new one. Drawn, by hand from a good artist friend, Polina (https://joiyaa.blogspot.com/). Finding your way around a new mountain is often confusing. It is easy to get lost. Sometimes I see it is a challenge for Bansko first timers to find that prearranged lunch place — especially when in that ski holiday “bubble” mode. Some places were just not shown on the piste map. Such as “The Peshterite”, located on the ski road. Same goes for The Izvorite hotel in Chalin Valog. So after receiving emails from people booking up their ski packages asking about the location of these “insider” places, I was motivated to go and improve it. In short, I realised that the mountain places mentioned in The Essential Guide to Bansko needed to be a little easier to find! So finally, the job is nearly done and now, with advertising support, this piste map will be available in most good places in Bansko to pick up, for free. Thank you for sending the maps and your suggestions for things to do. The maps are a fun but great alternative to the usual ones you see. The map of the piste is especially helpful and informative. Having them hand-drawn offers the chance to put in those extra bits that someone with local knowledge knows. You’ve also got all the right items marked on the maps, without it getting messy and too much info to decipher. Bansko iOS iphone/ipad app updates continue. And the Android app update tis looking really nice too. Please look out for these on your mobile device. And be sure to accept the regular updates. Please rate and review the apps too. 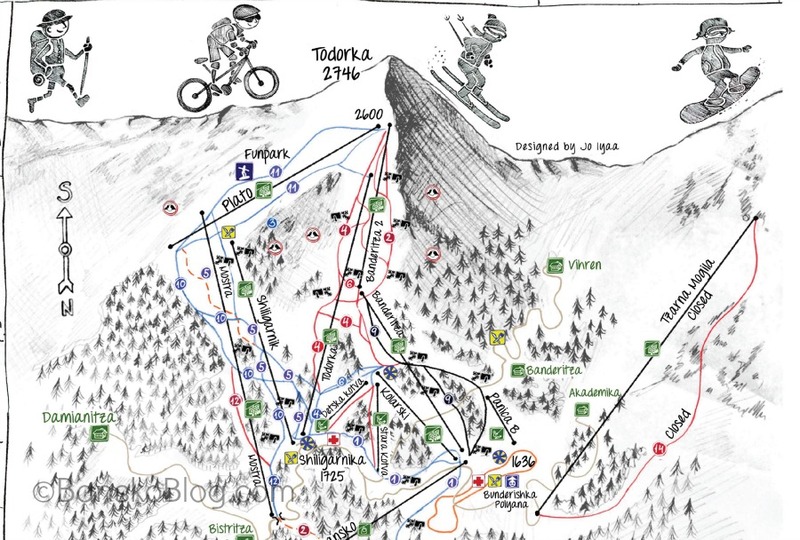 The update features a really detailed and more useful weather forecast, more lift and piste info, this new Bansko piste map and a new town map. I have to admit I am really excited about this app update. The app is more and more useful — and gives me more for what I am personally looking out for in a good app. The weather widget has wind direction, visibility, humidity. Some nice gallery images too. 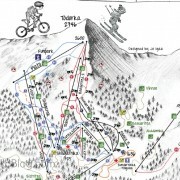 For example, the resolution of this piste map, on the app, is much improved. So you can share easily where to meet, where to ski and where to eat. 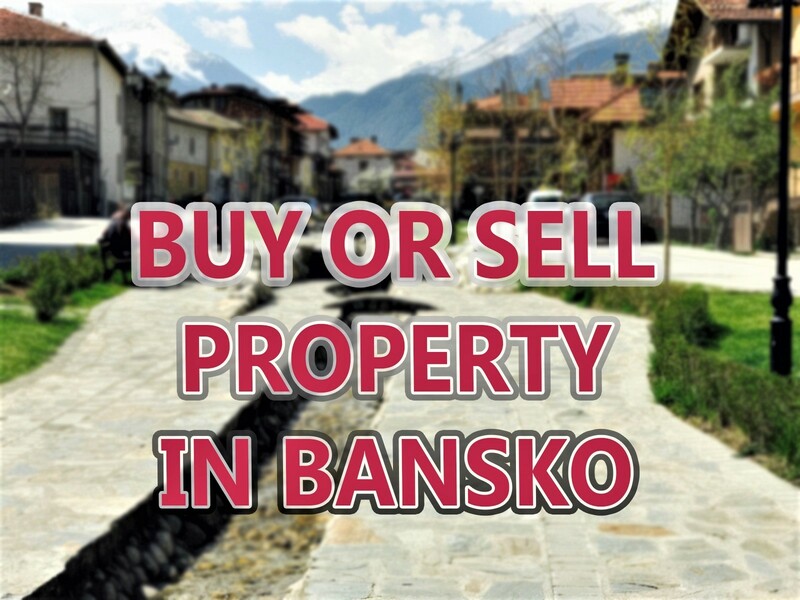 Type “Bansko” in the app store / Google Play store; or click here for links and QR codes. .
*This map is for personal use only. However if you have a web site and would like to use it, then just drop me an email. Permission will be granted assuming full attribution and an active link back to BanskoBlog.com. This map is free, but if you like it please share it…facebook, tweet, +1 buttons at the bottom. 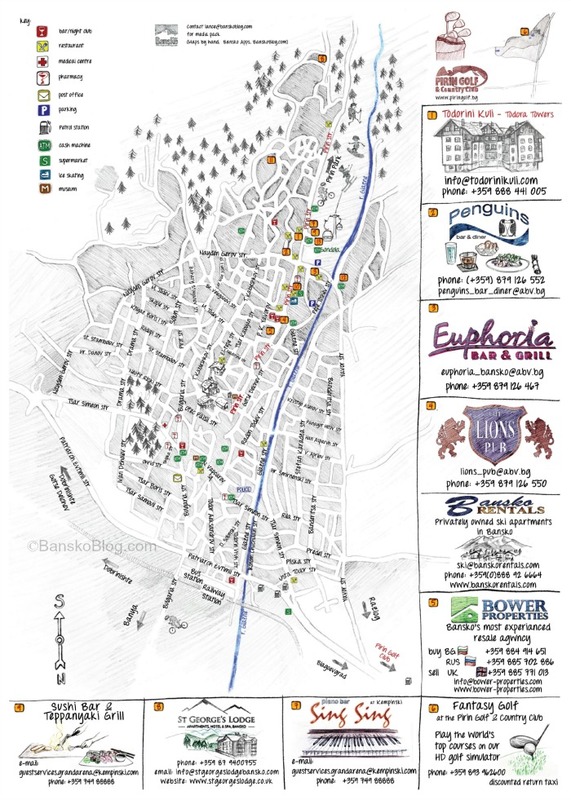 On the other side of the printed map is this Bansko town map. Same style. It shows ATM’s pharmacies, late bars, clubs, a selecion of restarants and hotels, petrol stations, parking, medical centres, ice skating rink, museums and the two main supermarkets. I would welcome your suggestions for improvement. Contact me or make your suggestions below. Thank you for reading. And, once again, if you like this, then please share it using the social media buttons below. I may be mistaken but shouldnt there be a resturant indicated at the botom of the Plato / top of the Mosta lift. Yes, thanks you for this. Watch out for the final version which will be replacing this one in a few days. Lots of little changes. Town map and calendar by hand too. All will be printed and available in bars. The calendar, page per month will be free for early booking clients. 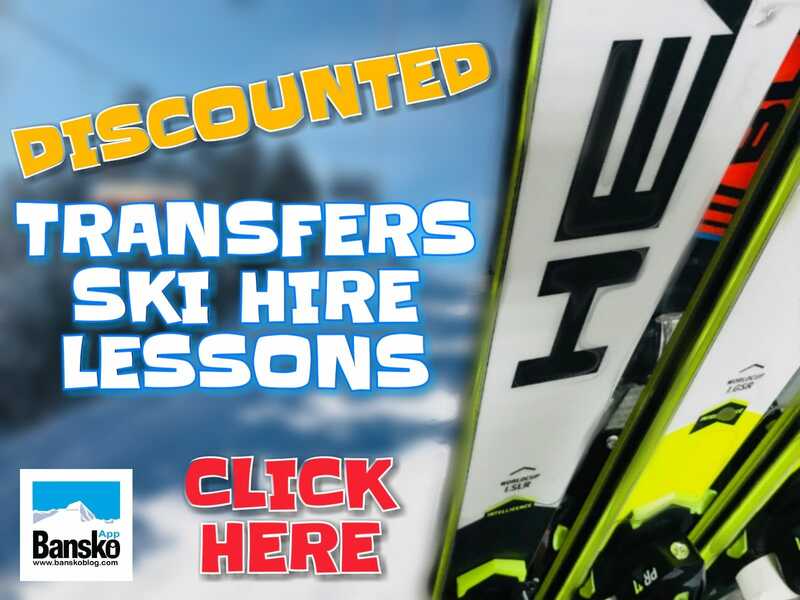 Thank you for reading Bansko Blog. You are correct, and this change along with the blue and yellow snack bars and other corrections are now on the new piste map on this page. The new town map is ready and has a selection of some of my favourite restaurants marked as well as late bars / night clubs, supermarkets, ATM’s (cash point machines. and pharmacies. Along with some other useful landmarks. Is there anything else? More comments are welcome. Additions and changes to this online version are welcome. Hi, other maps ive recently looked at have said that Tearna Mogila has been closed? will this be open this season? Yes on the final version the map says closed. There are no plans to open this lift for the coming season. I hope one day it will be open.